Many thanks to our sponsor for the TexData Mobile App Oerlikon Textile. The TexData Mobile App is the preeminent electronic information media of the industry worldwide. Available for iOS and from end of May 2013 also for Android OS it covers avery large part of the end-user mobile devices currently in the market. The TexData Mobile App is a dynamic tool able to retrieve the latest information and then making it available to the reader on the app after each start. Both online and offline, ensuring that all information can also be conveniently read during a flight for example. The TexData Mobile App supplies all the news on the TexData website, all the issues of the TexData magazine immediately after their publication and images of the most important events of the industry. About 25 % of top management today keep themselves informed via mobile end-user devices according to current market studies. 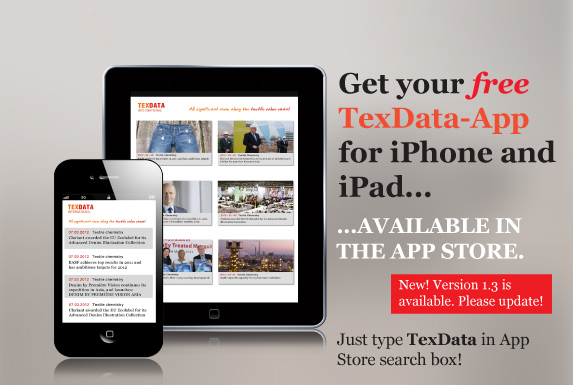 Just search for TexData in the Apple App store.